Summary: The Forgiveness Stones craze is sweeping the nation—instantly recognizable pouches of stones that come with a chain letter and two simple requests: to forgive, and then to seek forgiveness. But New Orleans’ favorite talk show host, Hannah Farr, isn’t biting. Intensely private and dating the city’s mayor, Hannah has kept her very own pouch of Forgiveness Stones hidden for two years—and her dark past concealed for nearly two decades. But when Fiona Knowles, creator of the Forgiveness Stones, appears on Hannah’s show, Hannah unwittingly reveals on air details of a decades-old falling out with her mother. 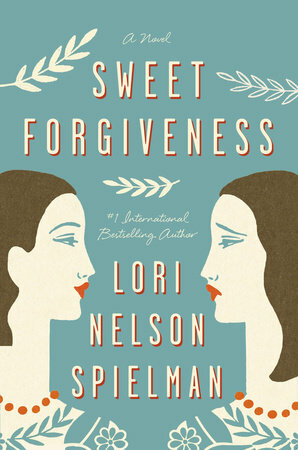 When I read the description for SWEET FORGIVENESS by Lori Nelson Spielman, I thought it sounded like a fun summer read... and it was! I actually enjoyed both the story and the messages from this novel, and it's not really a surprise because I had similar feelings about Ms. Spielman's last novel THE LIFE LIST. Here's the link to my review of that novel. SWEET FORGIVENESS has a pretty cool storyline. The basic premise of the story is this concept called Forgiveness Stones. Basically, there is a new craze that consists of pouches of stones and a chain letter asking for the recipient to forgive and then seek forgiveness from someone else. Hannah, a talk show host from New Orleans, has received a pouch but isn't a fan of the idea. She's been sitting on a pouch for the past two years that she received from the creator of the Forgiveness Stones, Fiona Knowles. Fiona wasn't very nice to Hannah back in middle school and has asked her forgiveness; however, Hannah has chosen to ignore her letter... until now. Hannah is a successful talk show host but she realizes that she needs something new to keep her career going strong. She decides to capitalize on the stones she received from Fiona and invites her to the show. However, things go very wrong from Hannah when the dark secrets from her past relationship with her mother come to light on on live television. Hannah's career and personal life take a pretty big hit. Hannah is not only embarrassed but she finds that her relationship with her fiancé is on the brink of disaster and her best friend (and ex husband's mother) have embraced the idea of the Forgiveness Stones wholeheartedly. In addition, her current and potential jobs as a talk show host are at risk. As Hannah hits bottom, she decides to re-evaluate her life -- both her past and her future. She looks at the relationship with her fiancé and her mother (and others) and decides to embark on a path of forgiveness. As she reflects on her past, she realizes that the "truths" she's been clinging to for almost two decades aren't as clear as she thought; and she has to find the strength to repair the damage she's done to others' lives... and her own. I really enjoyed SWEET FORGIVENESS! I loved the idea of the Forgiveness Stones and I could totally see how this craze could go crazy in today's society. Hannah was a fantastic character -- definitely flawed but not a bad person; and I appreciated seeing her struggles as well as her desire for redemption. This novel had a few twists and turns that I wasn't exactly expecting from a book like this. These actually brought the book to the next level for me. While I initially thought this book would be chick lit (not that there's anything wrong with that), it was definitely an intelligent read. Hannah was much more complex than she initially appeared, and the demons from her past were definitely pretty serious ones. Given how Hannah perceived her life, she really had to work hard at not only asking forgiveness from others but also learning how to forgive herself. SWEET FORGIVENESS would make a great book club pick. The story is very entertaining, but it also provides a lot of food for thought. There is a great reading guide available with thirteen questions. Some of the things you might want to explore include honesty, parent/child relationships, truth, friendship, memory, and obviously forgiveness and redemption. SWEET FORGIVENESS is a fun story with great characters and great messages. Highly recommended. I think we need a craze like Forgiveness Stones these days. This sounds really good! What a cool craze! Too bad it isn't real. I reviewed this one on my blog last month. Like you, I was surprised at the depth of this novel. I'd expected a light summer read. I enjoyed this one too! I liked that she need to not only forgive others but be forgiven and be humble enough to ask for it! I like the sound of Forgiveness Stones. I think everyone should have one.